The Kingdom of Tonga, also known as “The Friendly Islands,” is situated in the Tongan archipelago in the southern Pacific Ocean, about a third of the way along a line running from New Zealand to Hawaii. It lies south of Samoa, east of Fiji, and just north of the Tropic of Capricorn. The country's name comes from the Tongan word for "south." Tonga's population of more than 110,000 is nearly the same as that on the Hawaiian island of Maui, but on a quarter of Maui's land area. Settled for more than 2,800 years, Tonga is part of the cradle of Polynesian civilization (along with Samoa and Fiji). Tongans have always retained control of their own government. Natives of the islands have made their mark as athletes, as creative artists, and as hip-hop and opera singers. Everyday life in Tonga is heavily influenced by the Christian faith. The Tongan archipelago consists of 169 islands, 36 of them inhabited, lying along a general north-south line about 800 km in length. The largest island, Tongatapu, on which the capital of Nuku'alofa is located, at 257 km² comprises more than a third of the nation's area. Geologically, the Tongan islands are either volcanic in origin rising directly from the ocean floor or seismically uplifted coral limestone overlaying an older volcanic base (such as Tongatapu). The active volcanic islands are situated in an approximate north-south line located west of the more populated islands. A new volcanic island broke the ocean's surface during the 1990s. The climate is subtropical with a warm period (December–April), when temperatures rise above 32° C, and a cooler period (May–November), when temperatures are rarely above 27° C. The annual rainfall rises from 170 cm to 297 cm as one moves from Tongatapu in the south to the northerly islands closer to the Equator. The average daily humidity is 80 percent. Environmental issues facing Tonga include deforestation, as land is cleared for agriculture and settlement, and damage to coral reefs from starfish and indiscriminate coral and shell collectors. Overhunting threatens native sea turtle populations. Natural hazards include cyclones, from October to April, and earthquakes and volcanic activity. The first settlers in Tonga sailed from the Solomon Islands, a part of the original "Lapita culture" migration of Austronesian-speaking peoples out of Southeast Asia that began 6,000 years ago. Tonga is the oldest known site in Polynesia for Lapita ceramic ware, with samples dating back 2,800 years. The Lapita people lived and sailed, traded, warred, and intermarried in the islands now known as Tonga, Samoa, and Fiji for 1000 years, before explorers set off to the east and discovered the Marquesas, Tahiti, and other islands. By the twelfth century, Tongans and their paramount chief, the Tu'i Tonga, were known across the South Pacific. Civil war erupted in the fifteenth century and again in the seventeenth. Dutch explorers Willem Schouten and Jacob Le Maire were the first Europeans to arrive (1616), landing on one of Tonga's northern islands. 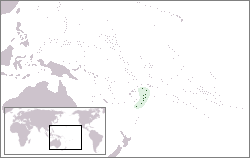 Abel Tasman visited Tongatapu and nearby Ha'apai in 1643. The British Captain Cook visited three times in the 1770s, Fletcher Christian led the mutiny of the HMS Bounty in Tongan waters in 1789, and the first London missionaries landed in 1797. Taufa'ahau, an ambitious young warrior, strategist, and orator, united Tonga into a Polynesian kingdom by 1845. Holding the chiefly title of Tu'i Kanokupolu, he was baptized with the name King George. With the help in 1875 of a missionary, he declared Tonga a constitutional monarchy; formally adopted the Western royal style; emancipated the serfs; enshrined a code of law, land tenure, and freedom of the press; and limited the power of the chiefs. Tonga became a British-protected state under a treaty of friendship in 1900, when European settlers and rival Tongan chiefs tried to oust the second king. It was part of the British Western Pacific Territories (under a high commissioner on Fiji) between 1901 and 1952. The friendship treaty and protectorate status ended in 1970, resulting in independence from Britain as arranged by Queen Salote Tupou III. Tonga is a hereditary monarchy. King Taufa'ahau Tupou V — a direct descendant of the first monarch — his family, some powerful nobles, and a growing non-royal caste of elites live in wealth; the rest of the population lives in relative poverty. A longstanding tradition of reverence for the monarch and universal access to free education and medical care soften the impact of the contrast between the rich and poor. The king has occupied the throne since 2006, and his father, who died in 2006, had occupied the throne since 1965. The royal government of Tonga claims credit for modernizing the economy. But it has been criticized for a series of poor economic decisions, such as investing in oil prospecting despite negative geological reports, considering disposing of nuclear waste in Tongan territory, selling Tongan passports to foreigners, and chartering an unusable transoceanic airliner on a long-term basis. King Taufa'ahau Tupou IV also proved vulnerable to speculators; he lost several million dollars to a financial adviser who called himself the king's court jester. A pro-democracy movement seeks better representation in Parliament for commoners, who make up the vast majority of the populace. The movement does not aim to overthrow the monarchy. Pro-democracy leaders have been jailed, and in mid-2003 the government amended the constitution to require newspapers to be 80 percent-owned by Tongans living in the kingdom. As a result, three independent newspapers lost their licenses. Opposition to the bill brought thousands of protesters out into the streets of Nuku'alofa and prompted calls for aid-donor countries Australia and New Zealand to put pressure on the government. In 2004, the decision was reversed and the daily papers returned to the newsstands. Meanwhile, a constitutional commission has been set up to study proposals to update the constitution. After the change of monarch, on November 16, 2006, rioting broke out in the capital city of Nuku'alofa when it seemed that the parliament would adjourn for the year without having made any advances in increasing democracy in government. Government buildings, offices, and shops were looted and burned. Tonga's economy is characterized by heavy dependence on remittances from the half of the country's population that lives abroad, chiefly in Australia, New Zealand, and the U.S., as well as foreign aid. These remittances are the country's largest source of hard currency earnings (followed by tourism), and Tonga depends on them to offset its trade deficit. Agriculture involves 65 percent of the labor force of about 34,000 workers. Squash, coconuts, bananas, and vanilla beans are the main crops, and agricultural commodities make up two-thirds of total exports. Main export partners are Japan, at 37 percent; China, 19 percent; and the U.S., 18 percent. Yet the country must import a high proportion of its food, mainly from New Zealand (37 percent). Other principal import partners are Fiji, 24 percent, and Australia, 9 percent. Many small businesses, particularly retail establishments on Tongatapu, have become dominated by Chinese immigrants who arrived under the cash-for-passports scheme that ended in 1998. Tonga has a reasonably sound basic infrastructure and well-developed social services. But high unemployment (especially among the young), a continuing upturn in inflation, pressures for democratic reform, and rising civil service expenditures are issues that continue to face the government. Almost two-thirds of Tonga's population lives on the main island. Although an increasing number of Tongans have moved into the only urban and commercial center, Nuku'alofa, where European and indigenous cultural and living patterns have blended, village life and kinship ties continue to be important throughout the country. Tongans, a Polynesian group with a small mixture of Melanesians, represent more than 98 percent of the inhabitants. The rest are European, mixed European, and other Pacific Islanders. There also are several hundred Chinese. The church is central to Tongan life. All commerce and entertainment cease from midnight Saturday until midnight Sunday, and the constitution declares the Sabbath to be sacred forever. 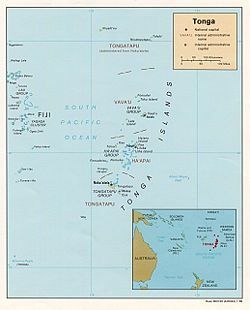 According to the latest census, 41 percent of islanders belong to the Free Wesleyan Church of Tonga, 16 percent are Roman Catholic, 14 percent belong to the Church of Jesus Christ of Latter-day Saints (Mormons), 12 percent affiliate with the Free Church of Tonga, and 17 percent claim other affiliations, such as the Tokaikolo Church (a local offshoot of the Methodist Church), Seventh-Day Adventists, Assembly of God, Anglicans, the Baha'i Faith, Islam, and Hinduism. There were no reports of atheists. Tongan culture has strict gender roles. Girls are taught to be submissive and are expected to stay at home. Boys are raised to be independent. Men have more political power, but women are ranked higher in the community. Women and men have equal access to education and health care, and are fairly equal in the workplace, but women are discriminated against in land holding, electoral politics, and government ministries. The Tongan words for homosexuals are fakaleitī (like a lady) and fakatangata (like a man). When not sexually active, such people are ignored; if sexually active, they find themselves condemned as perverts. Primary education between ages six and 14 is compulsory and free in state schools. Mission schools provide about 83 percent of education for children aged from five to 12, and 90 percent of those aged 13-17. Higher education provides training for teachers, nurses, and doctors, and offers some graduate degrees. There is a small private university, a women's business college, and a number of private agricultural schools. Further higher education must be obtained overseas. Tongans are well-educated, with a 98 percent literacy rate. Young Tongans can be heavily influenced by black, American youth culture in their dress, slang, body language, and music, especially hip-hop. Rastafarianism is another influence, manifesting in dreadlocks and adapted reggae music. Tongan performers who have achieved international success include Pauly Fuemoana of OMC (Ōtara Millionaires’ Club), and the operatic tenor Ben Makisi who adapted his knowledge of Tongan musical notation to explore European classical music. Tongan styles of sport, especially in netball and rugby, have influenced the way the games are played in New Zealand. Success for a Tongan means the ability to contribute to the extended family and to fulfill community obligations. Respect for seniority, restrained behavior in the face of need, and sexual propriety by Christian standards are considered important. Having a large family indicates success. Many Tongans have migrated to Australia, New Zealand, and the U.S. to seek employment and a higher standard of living. Significant Tongan communities in the U.S. exist in California, Hawaii, Texas, and Utah. Those abroad who send money to their family in Tonga are highly regarded. ↑ 1.0 1.1 1.2 1.3 Tonga. International Monetary Fund. Retrieved October 22, 2011. This page was last modified on 22 October 2011, at 15:59.